Total altitude gain: 10 km. 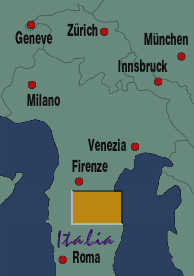 See my related page about a tour from Venice to Naples, which also touched Florence and Siena. That page also contains an Italy Survival Guide with general information about traveling by bicycle in Italy. We took the train from Berlin to Ancona, a busy ferry port town in the Marche at the Adriatic Sea. We had to switch trains in Munich, and only got rather unfavorable slow (D-Zug) trains in Germany and an old night train to Ancona because the fast trains don't have enough space for bicycles. We arrived early in the morning, and immediately left the coast and its heavy traffic on highway 16 for Osimo. The terrain is hilly. We gained 2200 meters of altitude the first day, going up and down through the Apennine foothills. However, the road is never really steep, rarely more than about 8%. From Osimo we followed highway 361 through Montefano, Montecassiano, and other small villages to Macerata. From there we followed highway 78 through Sarnano and Amandola to Ascoli Piceno. This day is probably one of the two hardest of this tour. Italian villages are typically on top of small mountains, which means frequent steep ascents on narrow switchbacks. But it's certainly worth it, the scenery is beautiful. Do not under any circumstances try to avoid the hills by following the coastal road! We had fewer problems than expected with supplies of fruit, pasta, and other staples of bicycle riding, even though we rode in May, which is well before the high season. We had to wait out a thunderstorm on the first day, but it was the only time we had to stop for rain. This sets the theme for most of the towns and villages we visit for the rest of the tour - they are all incredibly charmingly ancient and authentic, unspoiled by tourism and past centuries and, in some cases, millenia. It's like people living in big living monuments of the past, and making it look as if it were the most normal thing in the world. I don't think you can find this anywhere else in the world; even the French are much quicker mingling old with new. None of this, of course, stops the Italians from hurtling through their charming cobblestoned streets with noisy little automobiles or deafening two-stroke motorcycles. Of course, all this goes only for the small towns off the main industrial arteries. Rome, for example, is just a huge city like any other, with all those well-known tourist magnets sprinkled in. Florence is on the edge, perhaps because it wholly surrendered to tourism. Venice somehow managed to stay unchanged, probably because of its inaccessibility. 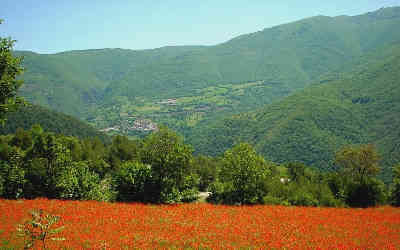 But if you really want to see Italy, Marche, Umbria, and much of Tuscany is the place. We left Ascoli Piceno on highway 4, and turned right topwards the mountains after the Arquata exit. Going through Arquata would have added a lot of climbing and we were about to cross the Apennine mountains. We now rode up the mountain at a constant 8% or so, through an endless series of small tunnels and switchbacks. You need lights here, especially a bright taillight. Traffic is very light but some of the tunnels are unlit. At some point there is a no-bicycles sign at a tunnel; turn right off the main road here. It's a long ascent but the views are breathtaking. I took 116 pictures on this day and the next (out of 900 total, digital cameras are great). The teaser picture at the top of the page was taken on the next day, on the descent from Norcia. A few other cyclists had already stopped too, and we had to wait until we could take our pictures of the red poppy field and the village in the valley from the Perfect Spot. The summit itself is rather boring. No especially good views, and signs promise accomodations that are either impossible to locate, or are hopelessly overpriced. We decided to continue downhill to Norcia. This is a charming little town with lots of little shops and a few restaurants, and much better than being cooped up on a hilltop hotel with nowhere to go. We got two rooms with a view right on the central square with the inevitable cathedral. The picture above shows their spare church, and something we noticed in all these small towns - they have a well-defined city limit, and beyond that there's just green fields and mountains. 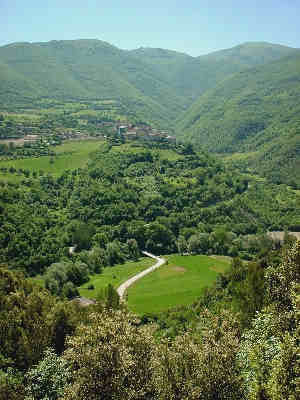 The picture on the bottom right above shows the view from the mountain, before descending to Spoleto. The view from there is stunning, it gives the impression of an aerial perspective. The town visible down in the valley is Spoleto. The Let's Go Italy guidebook (Harvard Press) describes it as a town known for its art, but we didn't want to stay overnight there and so just sampled the local cuisine (so-so) and the local ice cream (excellent) and rode on towards Assisi. The ride north from Spoleto follows highway 3, which is a wide and very busy road. We escaped on side roads whenever possible, but in some places there just aren't any alternatives. Even the side roads are not especially interesting, and nearly flat all the way. At Foligno we turn left, ride through the town, and follow highway 75. There are side roads here nearly all the way to Assisi, and we passed through towns like Spello. Still not very interesting. 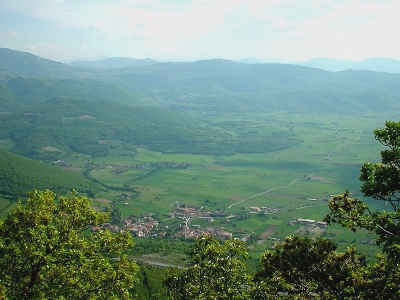 We planned to go almost past Assisi and then take a sharp left to avoid unnecessary hills, but we turned too early and got to climb some fairly steep roads, but that let us escape the busy main roads and compensated with many nice views over the valley. Assisi is on top of a hill, which it covers completely. 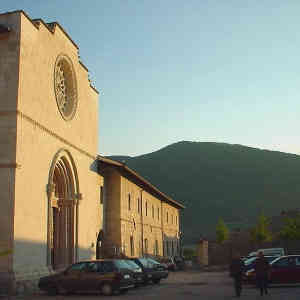 Assisi is well-known because Francesco of Assisi founded the order of Franciscans there. The main church of the order got seriously damaged by an earthquake a few years back, but it and most of the rest of the town had been repaired. 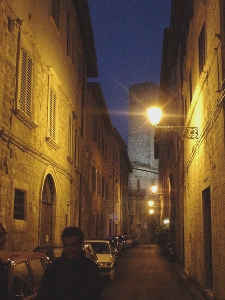 Although Assisi is a major tourist attraction, the town was not crowded. We refrained from having dinner in the Ristorante Metastasio. We planned to leave Assisi on highway 147 but took a wrong turn somewhere and got to ride on narrow and quiet roads. However, at some point we had to get back on 147, and had to ride on very busy and sometimes confusing roads, in a perfectly boring industrial valley, until we finally reached Perugia. We rode up to the top, enjoyed the view for a few minutes, and rode on. 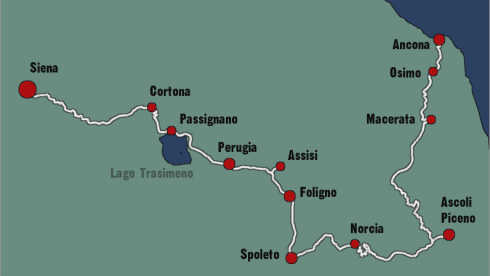 The road to Magione on the eastern shore of Lago Trasimeno is wide but carries much less traffic due to a parallel freeway. We followed the road around the north shore of the lake, with a stop at Passignano. 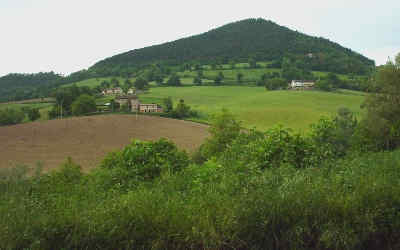 The road to Cortona leads first west and then north, past the small villages Riccio and Ossaia. As usual, Cortona sits on top of a hill. In Cortona, we stayed in the youth hostel (in a 13th-century building this time), and walked through town all evening and enjoyed the beautiful views in all directions. It is a small town with many narrow and steep roads, and as always all buildings were hundreds of years old. We left Cortona to the west, riding through Manzano to the south end of Foiana di Chiana, where we turned left to follow the road to Sinalunga. The road is reasonably quiet but unspectacular. From Sinalunga we could have followed the very busy highway 326 but we decided to ride through the hills to the south of 237. This added a lot of climbing to the ride, but the scenery was excellent, especially the part after Asciano, and the traffic almost nonexistent. Just before Siena, one of us had a mishap on a downhill curve, that left him in need of a doctor and his bicycle with a broken rim and stem and a bent fork, or in other words, completely unrideable. Luckily, an ambulance just happened to pass by. The other three of us contrived the unlikely four-axle vehicle shown in the picture above, and rode really slowly to Siena to meet our friend. All this meant that we got into town rather late, and had little time and opportunity to find a good hotel. We ended up in an overpriced little dark room close to il Campo, the main square of Siena. 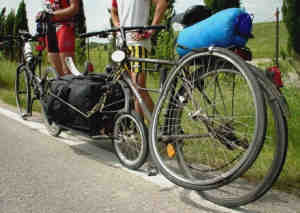 We originally planned to ride to Florence the next and last day of our tour, but without a bicycle this was impossible. 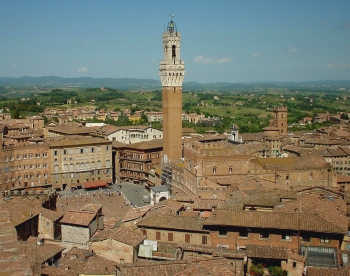 We decided to stay a whole day in Siena and take a train to Florence instead. This time we have more time to look for a hotel, and we manage to get a huge three-room flat under the roof of an old palazzo, which is part of the cannon d'oro hotel at Piazza Matteotti, for a little more than we paid the night before. Hotel prices seem to be directly proportional to the proximity to il Campo, no matter how shabby or spacious they might be. Siena was packed with tourists, but it still manages to remain a nice and friendly place, and not as overwhelming as Florence. I like Siena a lot and didn't mind spending an extra day there at all. We had plenty of time to visit the beautiful cathedral, and the one wall they managed to put up for a much bigger cathedral, until the bubonic plague put a stop to their plans in the 14th century. We visited the museum, which allows climbing up all the way to the top of that wall, providing a tremendous view. The picture of il Campo and the Palazzo Publico with its tower was taken there. You can see the river Arno in the foreground. The fat-looking bridge at the front left is the Ponte Vecchio, which is lined with tourist shops. The tower in the center is the Palazzo Vecchio at the Piazza della Signoria (the central square), and the duomo is to the right. If you want to visit Florence, I strongly recommend to read up on Florence's history in the 11th through 15th centuries, closely tied to the Medici clan, or you won't be able to enjoy the experience properly. It's all just stones if you don't know the living history behind them. Contrary to common misconceptions, it is hard to take a bicycle on an Italian train, with the exception of some local trains but these can't be used to go longer distances. Consequently we had to leave Florence at a really inconvenient time, sometime late in the evening, but since the train left over two hours late we didn't get to our next destination (Rovereto, near Lake Garda) until two o'clock in the morning, where we met with more friends. I'll leave that for another page. Looking back, the best part of this tour were the first three days, around Ascoli Piceno and Norcia, in the Apennine mountains. 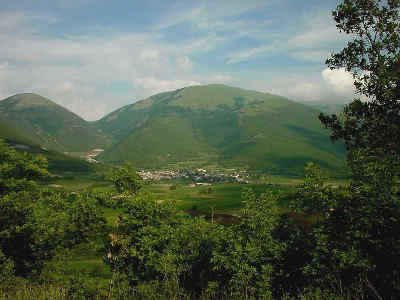 When I go there (when, not if), I'll spend more time in Umbria and Abruzzo to the south.